Happy Friday and welcome to the weekend, friends! This look here is completely inspired by the boys. The windowpane blazer, in a classic navy blue, along with the white oxford top, are the two staple pieces anchoring the look together. I love this look for the office, think business casual, but also with the swap for a pair of jeans, it becomes a casual chic ensemble for going out. The blazer fits true to size and also comes in a white windowpane print. Good morning and happy Wednesday, friends! I must say that I felt like a silver screen siren wearing this satin dress from Chicwish. Satin has always reminded me of the movie goddesses gracing the big screens in the 30s and 40s. They always seemed to be dressed to the nines in their luxurious silky fabrics! This dress has beautiful movement that swishes and sways with each and every step. Not only that, but the color, a nice deep wine, is stunning and quite festive this time of the year. The dress also comes in a midnight navy blue. It fits true to size and has a darling bow to cinch the waist and give the always flattering fit-and-flare style. Good morning, friends! I tend to usually wear softer colors, but every now and then it’s fun to have a bright pop, especially with a print mixed in! The berry color of this satin blouse is very vibrant and a true head turner. The bow neck is not attached, but rather a satin sash you can tie and adjust to how to you like. I love a bright pop of color once the winter weather starts to set in. It brightens up the dreary days! The material does feel quite nice and fits true to size. Good morning and happy Monday! I hope everyone enjoyed their holiday weekend filled with good food, friends and family, football, shopping, and maybe even putting up your Christmas decorations. Ava and I went to go see The Grinch again over the weekend and I have to say, I enjoy the movie just as much as she does! They did an awesome job of re-telling the story. We also started watching some Christmas shows starting with Frosty on tv, The Polar Express, and A Christmas Story. Don’t forget that Ruldolph is on tomorrow night at 8pm on CBS. On our last day at Valley Forge, Ava and I took one last drive around the park and decided to take a little walk before heading home. We stopped at a popular part of the park we’d never been to before. I’d always seen quite a bit of cars parked at this location and I eventually found out why. It was a stunning crisp morning with the sun offering endless amounts of light in the sapphire blue sky. We walked on a path that eventually led to an old beautiful estate that was picture perfect. On the walk we had passed some barns, old homes, fields, and a stream that were all amazing photographic backdrops. I passed three other photographers doing family portraits while there! It was the end to another fantastic trip to my favorite spot in PA. Happy Thanksgiving, friends! First and foremost, I am truly thankful for my family, especially my little Ava bug. I don’t know where I would be without their love and guidance. I am thankful for my friends, my health, and to you dear reader for your continued support. I hope everyone traveling gets to their destinations safely and enjoys this boutinful holiday with their loved ones. I’m looking forward to watching the Macy’s Thanksgiving Day parade, spending some quality time with my family, eating a delicious dinner, and watching some football! The photos above are from the first day of our Valley Forge trip. The weather was spectacular with the setting sun’s golden rays illuminating the land. The views looked as if they were taken straight out of a postcard. I wanted something comfortable to not only travel in, but also knowing I would be to walking around the park quite a bit too. This blazer has been my fall staple creating effortless classic looks. These boots also lend a hand in creating classic ensembles with retro inspired details. Ava and I both had on our cozy eyelash sweaters that we felt snug as a bug in. Good morning and happy Monday, friends! I hope everyone enjoyed their weekend. Some highlights from ours were a Christmas tea party we attended at an old local mansion that was ever so lovely and going to see The Grinch! Looks like I have a new movie buddy and I am completely thrilled (enter all the heart eye emojis here lol.) It was a great movie too. We both really enjoyed it. I’ve been on a skirt kick lately, particularly this pink wrap one, which I have another outfit with coming soon! Also, I’m loving a skirt and boot combo right now too. While I’ll forever love dresses and they’re effortless ease, I equally adore a good skirt and it’s versatility in creating different outfits. This pink skirt I’ve recently worn in three different looks, each unique and chic in their own way. This red one I wore three different ways this past weekend too. One was to the holiday tea party with the sweater I’m wearing above! This look above has beautiful soft colors and has a certain graceful ease and comfort to it. The wreath earrings (not heavy!) and embellished bow hair tie add some glistening glam that simply makes me smile. It’s all in those little details. Happy Friday, friends! We woke up to a winter white wonderland after yesterday’s snow storm. It’s the first snow of the season and Ava was quite excited for it, me not as much lol. The new fallen snow has me dreaming of the cheerful holidays ahead and all of the happiness and joy that comes along with them. The holiday season is the perfect time of the year to add a little something special to your wardrobe, this bow dress included! It exudes the perfect amount of classic elegance and charm with the darling bow detail in the back. I can’t help but to think of Audrey Hepburn in Breakfast At Tiffany’s when wearing this. She was the inspiration of this effortlessly chic holiday look. Good morning, friends! 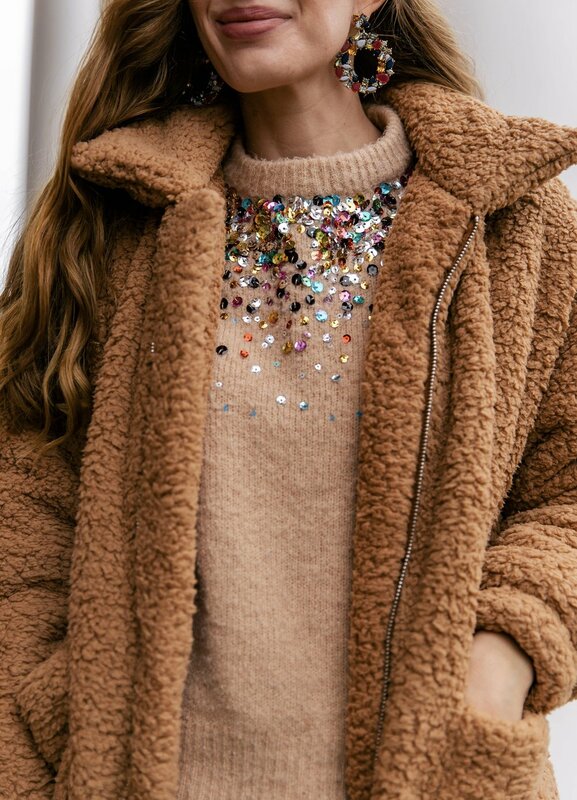 ‘Tis the season to add a little sparkle to your everyday looks. While I love the classic ensemble with a mix of pretty plaid and some ruffles, it’s the shimmering jewelry pieces that elevate this outfit. How gorgeous are they?! I’m particularly swooning over the embellished barette. Time and time again, I’m drawn to classic styles that stand the test of time such as this plaid ruffle skirt, navy sweater, and navy pea coat. All are key pieces that could have been worn twenty years ago or twenty years from now. Happy Friday, friends and welcome to the weekend! There’s something about this outfits that’s quite magical to me. Maybe it’s the dazzling embellishments, perhaps it could be the beret, or even the fact that the entire outfit is pink, but one thing is for sure, the ensemble is a head turner. Nearly everyone I ran into, friends and strangers alike, complimented this look. This is the first time I decided to try wearing a beret too. The outfit started with this embellished pink sweater from Chicwish with faux pearls and beads along the neck line. The sleeves are sheer with a velvet tie at the wrist making the top extra feminine. These glitter flats with pearls are from Blair Eadie’s collection with Nordstrom. They are not only comfortable, but extremely pretty and run true to size. The belt is also from the collection, but currently sold out. The beret was the last piece, the topper if you will, to complete this cheery pink mix! Last weekend NEPA saw its peak of the brilliant fall colors with the trees ablaze in stunning reds, oranges, and yellows. I headed over to Hillside Farms to capture the beautiful scenes all around me. Each glance seemed as if I had stepped into a painting. For my photographic adventure, I wore this burgundy coat from Chicwish to keep me stylishly warm. It has an oversized fit, perfect for layering underneath!, and faux pearls for buttons. I love how this adds a splash of color to my outerwear. When the cold weather hits, all we pretty much see is what coat or jacket someone has on while outside. Why not make it something colorful and fun! Good morning and happy Monday! I hope everyone enjoyed their weekends! I went to go see the Nutcracker and the Four Realms, which definitely put me in the Christmas spirit. I also started and finished watching the series Bodyguard on Netflix. I’m pretty sure it just came out. It’s a good one! It kept me on the edge of my seat the whole time. My dad and I also went to my church’s roast beef dinner and had the yummiest meal. Did everyone enjoy the extra hour of sleep? I’ve always loved that extra hour of shut eye, but it gets dark early now, which is sad, haha. Daylight is precious. This red sweater dress, like the Nutcracker, also puts me in the festive spirit! It’s a ribbed material with faux pearls trimmed along the front. The fit and flare style is darling and fun for a bit of a twirl. While the Christmas season comes to mind for this dresss, I’m also thinking of it as something to wear for Thanksgiving too. I’ve always been particularly drawn to a red dress for special occasions, be it a holiday or even a school dance. Fun fact, almost every school dance I went to, I wore a red dress. This one from Chicwish definitely fits the bill! Good morning! Happy weekend and also welcome to November! I can hardly believe we are so close to the end of 2018. Where did this year go?! I’m excited for the holiday season though and all that comes along with it. For November, there’s obviously celebrating Thanksgiving, but I’m also looking forward to everything and anything that is cozy and bright. Think lots of layering, sweaters, some “extra” razzle dazzle, snuggly blankets, and also my Christmas movie list. It’s good to start rounding those up to start watching after Thanksgiving. We may have even started listening to Christmas tunes too! No judging lol. Now, onto this English Country inspired look. This is actually my favorite fall outfit that I’ve styled this year! The color combination, with this stand out blazer, and all of the layering are what make me love this so much. The ensemble has a proper feel while still being relaxed and even a bit playful with the cute deer print on the Woolrich sweater. Jeans would also be an excellent choice for the outfit, but I feel the warm brandy color of the corduroys packs a beautiful color punch. The piece I am head over heels for is this English Wool blazer. My inspiration came from my grandma and grandpa Kretchmer, who were the epitome of the country gentleman and lady. I kept thinking of them and the classic English country looks when putting this look together. This gorgeous coat just came out and is very similar to the blazer, though as a topcoat. The color is just stunning! Happy Halloween from Ava and I aka, Darth Vader and Storm Trooper! I hope everyone enjoys the day trick-or-treating and getting dressed up in their costumes. Good morning and happy Monday, friends! I hope everyone had a great Halloween themed weekend! We most certainly did and got to partake in some Halloween events decked out in our costumes. I’m sure everyone can guess who Ava is this year, haha. I’ll be sharing those photos this Wednesday on Halloween. Reformation Sunday was also this past weekend. Our church celebrated with a big fall festival complete with a lunch-in, baking contest, pumpkin decorating, making a scarecrow, and a bonfire with singing and s’mores. Ava said it was the best party ever! Everyone really enjoyed her saying that. We had a fantastic time. Speaking of the weekend, this look is one I wore recently while running some errands. I love layering with a vest, but more so, I adore the colors and how beautifully they all blend together. I always find myself drawn to burgundy’s and cranberry’s this time of the year. These OTK boots have become an absolute staple for me and get the most compliments of any shoe I’ve worn. They stand out and also work with just about every type of fall outfit. Let’s just say they POP! This one and also this one are very similar to them. The flannel plaid top has been on repeat quite a bit lately, usually when I need to grab something quick to put on to take Ava to school in the morning. Its soft with an oversize boyfriend fit. I’m wearing my normal XS and still have some room to wiggle in it. Happy Friday, friends! This skirt from Chicwish combines two of my favorite fashion things about fall, plaid and tweed. I do feel the sizing is a bit off. I would recommend sizing down for a good fit. I got my normal XS and was practically swimming in it. That being said, the skirt itself is gorgeous and blends right in with all of falls stunning colors. While some may start to shy away from skirts with the cooler weather, it was a particularly cool and windy day when taking these photos, I say full speed ahead with skirts and dresses alike! I love wearing OTK boots with a skirt to help with the cold. An added bonus, OTK styles elongate your legs. Something is on the shorter side certainly appreciate. I hope everyone has a spook-tacular weekend! Happy Halloween if your celebrating early!